Etched with famous marathon routes, these pint glasses are just the thing for post-run recovery beers. Mile after grueling mile, what's on a marathoner's mind? It might be the most deliciously well-deserved beverage imaginablethe post-marathon beer. And never has there been a more suitable glass for it. 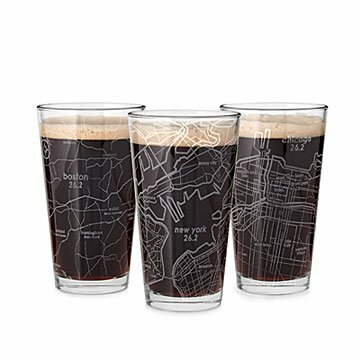 Brian Johnson's classic pint glasses are beautifully etched with the famous routes and surrounding city maps of top marathons, plus finish line coordinates and date of the inaugural race. A unique gift for seasoned marathoners and aspiring ones alike. Glasses made in Ohio. Etched in New Hampshire. Wash the glass in the dishwasher before using for the first time. A great gift idea for any Marathon Runner! This was a great gift and my boss really liked it and was impressed that it had all the race landmarks on it and the date of the first Boston Marathon. I personally would have liked it if the race route we're etched a littleore so it was easier to see. Might be easier once there is a beer in the glass though. Great gift for a marathoner! Love the design and style, plus lots of marathon map options available! What a surprise this will be for my husband. This is a fun way to share his accomplishments with everyone in our home! Bought it for a gift - she loved it! I sent this to my friend in California who had run the Chicago marathon for the umpteenth time shortly after her birthday. It made a great gift! So unique and would buy again! Great gift for a marathoner.